Russian smartphone maker Yota Devices has launched of its flagship, dual-screen YotaPhone 2 in China. The smartphone will be sold in partnership with China Unicom, the carrier with the second-largest subscriber list in the country. The Chinese version of the YotaPhone 2 supports the local LTE frequency, and has China's most popular mobile applications and social networks pre-installed and adapted to the second screen of the smartphone. The smartphone is expected to sell for 4,888 yuan (about $787). Online sales in China will be made through Tmall, a Chinese-language online retailer. China Unicom, one of the world’s largest mobile network operators, signed an exclusive agreement with Yota Devices Distribution for offline sales of the device.The official Yotaphone 2 presentation took place in China Wednesday. Chinese President Xi Jinping became the first user of the smartphone in China. He was given an early model by Russian President Vladimir Putin as a present. YotaPhone 2 is expected to be popular with rich Chinese, and won’t be competing with cheaper local-branded smartphones which average about 1,500 yuan (about $242) in price. 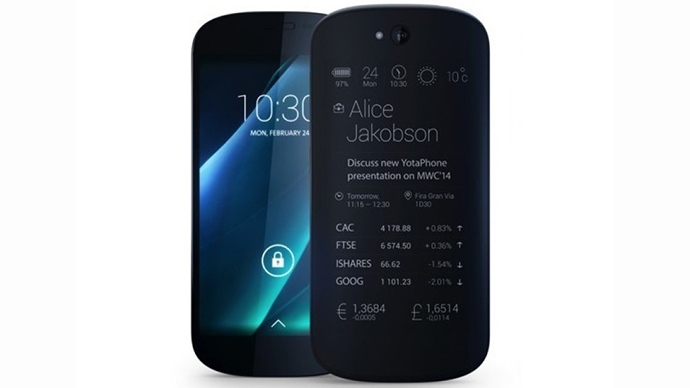 YotaPhone 2 was developed by Russian company Yota Devices. It has two screens, one uses E-Ink (electronic ink) technology. The E-ink screen allows the device to save energy. The smartphone uses the Android OS and can operate for up to 17 days on one charge. Yota Devices was established in 2011 and announced the introduction of the smartphone into the Chinese market in February.